Urns are specifically made for holding cremated remains. They range in shape and size, and can be simple in form or a true work of art. 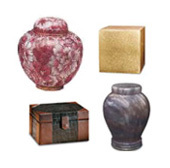 The urns we offer come in a variety of natural materials, such as bronze, wood and stone. We also offer smaller keepsake urns, mementos and jewelry.